D.J. 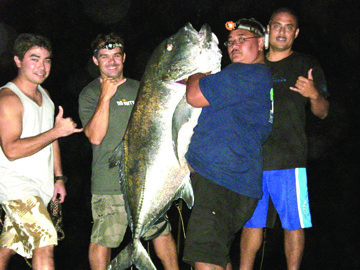 Ojano was fishing with his girlfriend 'Tita' Segobia, Josh Takayesu, Ricardo Garza and Fredo Desha on the Kau Coast of the Big Island when he made his historic 107-lb ulua capture. Tired from a week's work, he had to be convinced by Fredo to "put it to the lead" and get a line in the water. Soon his red 12-foot Island Rodwrap pole was bent over, his Newell 550 reel was screaming and the Ande 80-lb test line was crackling off the reel.